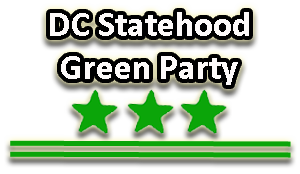 DC Statehood Forum: How do we win! April 7, 2011 — On April 7, speakers and guests will review the history of where we have been and a path to how we finally get to Statehood for the District! March 3, 2011 — Preparing for the Spring City Council Session Regarding the City Budget with a Panel and Q & A.
January 6, 2011 — DCSGP meets January 6th to elect two Delegates to the national party and five At-Large Steering Committee members. We will talk about how to build the party throughout 2011. June 5, 2010 — Green Soup Party at La Orilla on Saturday, June 5th.Meet can didates & sign pettitions. March 4, 2010 — Come to the March General Assembly to help develop neighborhood campaigh issues from your perspective. SUPPORT LIVE MUSIC IN DC & FIGHT INJUSTICE!